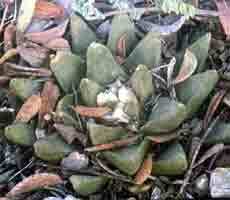 Ariocarpus retusus LRM252, A large plant of the Cerritos population. 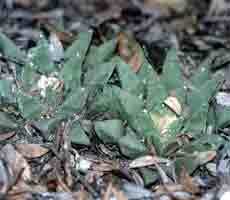 Ariocarpus retusus LRM252, growing in the shelter of low shrubs. 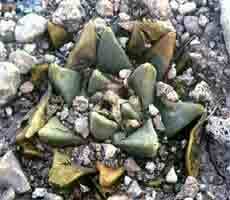 Ariocarpus retusus LRM252, a plant growing in an exposed situation. The plants of A retusus at this location are of the type which has been described as A. retusus scapharostroides, plants were mainly small but reproducing well and many young seedlings were seen.